We are excited to announce that we will be hosting the annual GBEA fall conference in Young Harris, at the beautiful Brasstown Valley Resort & Spa, nestled in the North Georgia Mountains! This conference focuses specifically on middle and high school Business and Computer Science teachers by providing a variety of speakers, hands-on technology workshops, and interactive breakout sessions on relevant and timely topics! All Business and Computer Science teachers, CTAE Directors and Supervisors, WBL Coordinators, and other educators passionate about finding relevant, successful practices are invited to attend! Any registration payments not received BY AUGUST 31ST will increase to the late registration fee of $350. by presenting at the conference. This year, all conference attendees are asked to stay on-site. If an attendee stays off-site a fee will be assessed at registration. 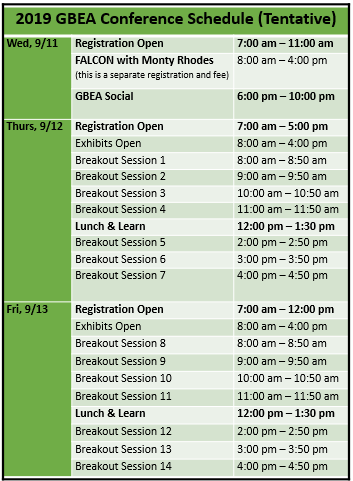 ​For questions regarding Conference Registration please contact GBEAconference@gmail.com.